During Gerry’s tennis lesson, Madeleine and Ella came to the adjoining court with their Mini Club for a mini-tennis session. Jane and I stayed to watch them. It chokes me remembering how my heart soared with pride in Madeleine that morning. She was so happy and obviously enjoying herself. Standing there listening intently to Cat’s instructions, she looked so gorgeous in her little T-shirt and shorts, pink hat, ankle socks and new holiday sandals that I ran back to our apartment for my camera to record the occasion. One of my photographs is known around the world now: a smiling Madeleine clutching armfuls of tennis balls. At the end of their session, the children had been asked to run around the court and pick up as many balls as they could. Madeleine had done really well and was very pleased with herself. Gerry loves that picture. So no tennis match between the parents then ! Rachael said that Jane took it. I don't know if Jane was ever asked about it though. No Fate Worse Than De'Ath wrote: Rachael said that Jane took it. I don't know if Jane was ever asked about it though. As Murat reportedly told Daily Express back in the Summer - BRING THEM ALL BACK TO PORTUGAL. From the topic: who took the tennis court photo? Btw those sandals don't look new to me. Another good topic is Video analysis of the tennis photo, by Garyp. Re: Who took the tennis court photo? On Tuesday 1 May, after my tennis lesson, two maintenance workers came to have a look at our washing machine, which I couldn’t get to operate. Gerry had also managed to break the window shutter mechanism in our bedroom shortly after we’d arrived, in spite of the sign asking guests to be gentle with it. What can I say? It’s the Gerry touch . . . The two men looked at the washing machine first. Once they’d established that the problem was something simple – not quite as simple as me not having pressed the ‘on’ button, but not much more complicated than that – I went to meet Gerry, whose lesson had started at ten-fifteen, leaving them to fix the shutters. 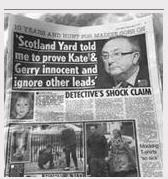 Rachael Oldfield says it was taken on Thursday 3rd May - Kate says Tuesday 1st?????????????? Rachael says Jane took it, Kate says she did???????? Molly wrote: Thanks, Candyfloss & Marian. I did read the book (then lent it to a friend) but have to admit I dozed through most of it. I think Kate claims to have taken it. She refers to running up to the apt to get the camera but not sure if she then mentions that she actually took the shot. I think it's Russell or Matt who mention that they think Jane took it. But they don't ask Jane in her interview. Interesting that they think it was Jane because that means it wasn't on Kate's camera when they looked for a suitable picture of Madeleine for the missing poster. I'd love to know when it was supposedly taken. “The third of May, are you able to summarise the days activities”? Reply “Yeah, the day was actually, it was different to the others because, well it was warmer weather wise, erm we went to the Millennium for breakfast as usual, erm we did that every day, Gerry and Kate didn’t, it was just too far for them to go with the twins, so they didn’t ever go for breakfast up there, I think apart from the first morning, erm so Matt, Grace and I went up to the Millennium, there was nobody else there from our group, erm and just as we were finishing and leaving, Russell arrived with Ella and Evie, erm Jane, because their tennis lesson had been cancelled the day before, Jane was in the, stayed back at the Ocean Club to start her lesson, cos that started at nine, erm and so I took Grace to the crèche and Matt stayed with Russell, erm and they took Ella, I think they took Ella down to her crèche and then the, Matt wanted to go down to the beach and go sailing, erm so I took Grace to crèche and then erm Matt and I were having a tennis lesson at eleven o’clock, and so basically it just, you know I just sat by the pool and read my book, sort of waiting for the tennis lesson and Kate, Kate was there and we sat together and had you know, chatted a bit, erm and then I think Diane might have been there as well, remember chatting to Kate cos we were talking about schools and that sort of thing, erm and holidays, erm and then I think it must have been at about ten thirty, Madeleine and Ella and their sort of group came to have a tennis lesson as part of their crèche activities, erm and Kate didn’t have her camera and Jane was there then as well and Jane took some photos of both Madeleine and Ella, that’s one, that poster of Madeleine with the tennis balls, that sort of pictures”. i know its not wimbledon but how many 3 yrs olds have the attention span or the speed to be a ballgirl. from the video of maddie trying to board the plane she was hardly the sprightly toddler being portrayed in the crimewatch programme (trailer is already online). would gerry have the patience to put up with his daughter dawdling along the court while he has to wait to take his serve? I don't think they would let a three year old on to the court during an actual match. Perhaps the tennis court reconstruction is not supposed to recreate an actual date or moment, but more of a general, this is the type of family fun they were having every day on their holiday. Otherwise I don't know how this scene would fit into the timeline. And how safe would it be to have a 3 year old running around a court while two adults whacked the ball about in the competitive manner that this pair will undoubtedly have? Indeed yes. We know how safety conscious the McCanns were as parents! Where were the twins when all this family fun was going on? 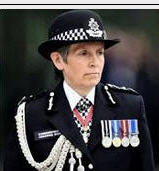 Well the woman in the clip looks like Kate but in her book she made no mention of Maddie doing the ball thing dressed like that other than when only Gerry was playing. It might be fluff to create a scene, but this is a serious reconstruction to solve a crime and this is one of only a few photos of the missing child from that holiday. The circumstances in which it was taken should be factual. The time and date should be accurate. Who is the girl in the tennis ball photo? She looks nothing like what we have been told is Maddie. Maybe it's because she is smiling and her face is crinkled but I have always felt that photo does not fit in with other photos I've seen. Poe wrote: Where were the twins when all this family fun was going on? Sleeping? after all it was like dining in the backyard. taking turns in the umpire's chair? This is from 2011, it is the first time that I have seen it but I don't know if it has been posted here before. Two Entirely Different Tennis Courts! What's this then Gerry... two entirely different tennis courts! Who do the McCann's think they're kidding with all those photos of several different children lookalikes of Madeleine, which is plainly obvious to anyone with an ounce of Common Sense, but not only is there more than one Madeleine, there's also more than one tennis court too! 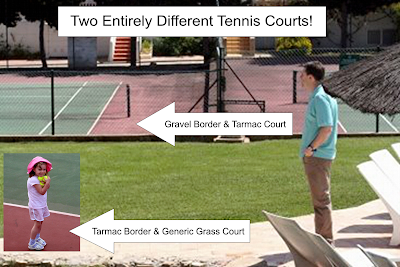 See the photos and judge for yourself, as the court that Gerry is standing next to in the Ocean Club hotel complex the surface is green tarmac with a pink gravel border, the type used in public parks and hotels because it's pretty cheap, whereas the photo inlay of Madeleine standing on the said same tennis court in the Ocean Club hotel complex, the surface is Leisuretex green court and pink border, the type used in professional matchplay leasure centers in the UK. There's also a watermark on the Madeleine tennis court photo on the green Leasuretex edge, which indicates that just priro to the photo being taken there was a shower of rain, you can just see the rain watermark just along the white line on the green Leasuretex, which prove's this photo of Madeleine was taken in the UK around April and not Portugal, as indicated by the time the McCann's say this photo was taken at the Ocean Club, it was the brightest time of the day in Portugal. But the photo of Madeleine is not that bright and sunny as compared with the photo of Gerry taken a year later at the same time of day as the Madeleine photo, the difference in brightness of the sun is a hell of a lot different between the two photos, and could not possibly be the same global location between both photos. So not only are these two tennis courts two entirely different tennis courts, the locations of each tennis court are entirely different globally also, which proves that Madeleine could not possibly have had her photo taken on the Ocean Club tennis courts with Gerry, Jez Wilkins and his girl friend Bridget O'Donnell, on or prior to the 3rd May 2007 as stated by the McCann's! 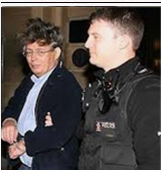 Are the McCann's playing a game of 'Much ado about nothing', because I say the McCann's Madeleine never existed, and Charity out of Sympathy is the game the McCann's are playing is just to generate profit out of the public! If the photo was taken at all it was on the Monday morning, 30th April, when the Lobsters had their mini-tennis hour. It's early on in the holiday; if it is a fake it makes you wonder if all the holiday photos were faked. Would it be a possibility that the mccanns hadn't actually taken a single photo of madeline while on the holiday. They may have feared how this would sound to the public along with the kids left in club all day and alone at night so they had to produce something. 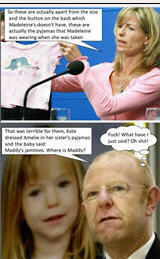 @Irisheyes wrote: Would it be a possibility that the mccanns hadn't actually taken a single photo of madeline while on the holiday. They may have feared how this would sound to the public along with the kids left in club all day and alone at night so they had to produce something. That's an idea. I always wondered, why Kate would put so much emphasis à la Mrs. Bucket on the GAP and Monsoon clothes of Madeleine [which I have BTW not been able to find in their 2007 design lines] and also mentioning the "lovely shorts and sandals" [not my idea of "lovely"] in the tennis photo, whose origins are clouded à propos WHO did take that picture and when. So "Madeleine was there", but not photographed. Like I said, it's an idea. Is there anyone who is good at photo editing here and can take a close look at the picture from the tennis court? Maddie has a defect on the right pupil. I'm not sure if that will prove anything. Some photos have the mark and some don't. No Fate Worse Than De'Ath wrote: I'm not sure if that will prove anything. Some photos have the mark and some don't. 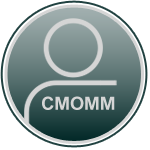 Maddie's eye defect called Colobomas and are extremely rare,about 0.007% of the population. ........but, if the mark has been added to the photo, that doesn't prove that Madeleine had the condition. As I said some photos show it and some don't. It's a mystery (that word again!) 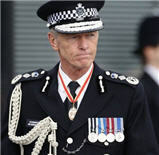 why the McCanns did an enormous u-turn in 2011 by saying that they'd never made much of it. @NickE wrote: Is there anyone who is good at photo editing here and can take a close look at the picture from the tennis court? There are a few people here with skills in photo editing. The lively thread on "The last photo" discusses at length and in some detail the various opinions on whether the swimming pool photo has been manipulated. It turned into a ****fight but even that is edifying. Fwiw, I don't think that photo has been altered. I have no direct knowledge of the case. I'm just reading the files. It's all speculation. Don't sue me! @sharonl wrote: This is from 2011, it is the first time that I have seen it but I don't know if it has been posted here before. They look like the same tennis court to me. I don't see the larger image as gravel, it's just a photo of the same tennis court that is lighter so the colour is lighter. That isn't a grass court. You can clearly see a smooth mark where the court has been finished. With the greatest respect, can I ask what makes you think they are not the same court? Sharon was reposting someone else's blog. I don't know whether or not she agrees with it. As for the pool photo, I think it could be genuine as regards the people in it but not that it was taken when it's claimed.